Riders gathered in the early morning twilight for the Long Course start. "Hey! You gonna wake up or what?!" I poked Jeremy in the arm. His alarm had gone off and shut down already, but he hadn't moved a muscle. It was high time to get ready and find out where I was going to eat breakfast, and he was coming one way or the other. Fortunately, it didn't require anymore motivation than I had just provided to jump start the man into action. In fact, we got ready probably too early. I wondered if the rumors of a 5:00am breakfast there at the motel were going to be coming true. Fortunately, they were true, and I ate some scrambled eggs, a few strips of bacon, and had grabbed a bagel and a banana from the baskets for later. Tony joined us at the table as well. Then as we were finished with that, we went out and made our final preparations to leave. Oh! I forgot my drop bag! Good thing Jeremy remembered it then. The event allowed you to pack a drop bag for Checkpoint #3, so that helped lessen the load that I had to carry. Then we rode over the Interstate to the KOA Campground front lot where the event was to start from. There were several riders already there, and folks were nervously chit-chatting with each other. I joked that the weather was so good we'd only have ourselves to blame if we didn't make the course. The Sun cracks the horizon on a clear blue day. The road slowly winds up into the hills. The views are expansive and humbling. There is a herd of cattle running up the hill here, but they look like ants. The event rolled out with no issues. Not like last year at all when we hit these very same roads and were met with wet, soupy gravel and derailleur wrecking mud spots. This time it was deep, loose, sandy gravel which made for tougher rolling unless you could find a line where the cars had thinned it out down to the more solid base. Some guys were wagging their rear ends as they crossed over deeper lines of sandy gravel, but my WTB Trailblazers just floated along with seemingly no ill affects. Jeremy had planned on jumping up front with the leaders for a while then he was going to drift back to spend the rest of the day with me. Tony sped up the road as well, so in the beginning it was just myself plugging along at a comfortable 13-14mph and enjoying the early morning scenery. It was pleasant with little wind and the Sun was illuminating things in a dramatic way. This is me coming up the same grade seen from the other way in the previous image. Image courtesy of Scott Redd. I reached a familiar turn off to a grassy two-track road and was still amazed that we got to ride on this rustic, "barely there" road. I met up with Jeremy and Scott at the top and we all took off down a long stretch of minimum maintenance road that featured lots of climbing. No gentle grades here! 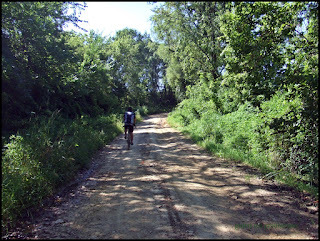 These were steep, a bit longer than typical Iowa climbs, and in places, were rutted out a bit. These were the rollers that essentially killed any chances I had of making the checkpoint cutoff in time last year. That was when these greasy hills were wet with recent rain fall. This time they were of a very different nature. These were dusty, and at the bottom, were filled with silty runoff that was probably five to ten inches deep in places. Powdery dust flew up off of our tires and up into our nostrils. It was a bit challenging when the skinny tired bikes were swapping ends and I was overtaking them on my Fat Fargo, blasting by them as they grabbed a handful of brake lever. Scott referred to this dusting I gave him on a couple of occasions as being "GT-eed". These MMR's went on and on with one steep climb followed by a hairy, rutted, blown out descent, one after another. Jeremy, who doesn't have the "Tomac gene", biffed a few times in this section. I looked back and he was gone! Within a few miles we stopped and he caught back on, a little bloodied and dirty, but seemed none the worse for wear. The section was pretty technical from the standpoint of a gravel event, and was more in the mountain biker's wheelhouse, so I can see where things like what happened to Jeremy could occur. The event rolled onward to checkpoint number one, and Jeremy told me that it was pretty front end loaded with climbing. 5000 feet in the first 48 miles. I was feeling fine, eating, and drinking, but maybe not enough. It took us a little over 4 hours to get to the checkpoint, but I hadn't drank 4 bottles of water yet. Close, but I should have downed all six I had with me. Well, I figured I had enough time in the bank I could maybe take it easy during the warmest parts of the day and then make it through CP#2 and assess my day then. I want to thank the DSG Crew, Chad, Merrie, Matt, Garret, Bob, Paul, Kyle, and all else who lends a hand in putting on this spectacular event. I want to also extend a special thank you to all of you that mentioned that you read this blog regularly and have learned things from my writing, or just that you enjoy it as a part of your day. That means a lot to me. And now...... on with the show. Okay, so as with Dirty Kanza, I went out to Odin's with Tony in his nice Ford truck. We left rainy ol' Iowa for Nebraska at 8:00am sharp with excitement and expectations. We had our rigs prepared and sights set Westward. 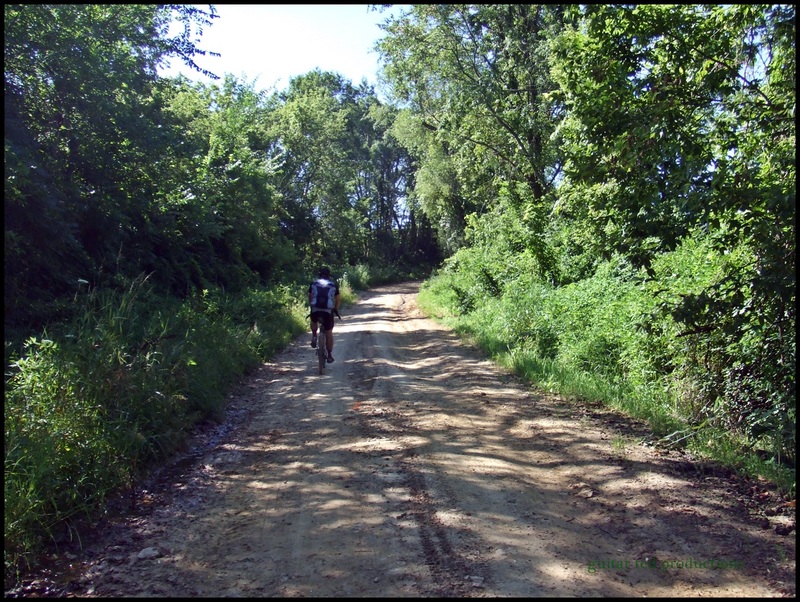 Odin's Revenge, perhaps the antithesis of the Dirty Kanza 200 in almost every way, is a definite throwback, if one can use that term about gravel/backroad events, to the earlier days of the gravel scene. A time when events were smaller, less hyped, and more about the ride and the people in it. Not that "bigger", more hyped and produced rides aren't great, but Odin's reflects a different way of doing things that is appreciated by me and others that attend the event. Different flavors and all.... and that's a good thing. And there's the turn off! So, I know what many of you may be thinking- Nebraska? Flat! Boring!! Bzzzzzt! Wrong answer. What many folks do not realize is that the interstate travels in the wide, yawning Platte River valley. You know- flat and boring? Go off that ribbon of concrete either North or South and you will discover a Nebraska you might just be surprised ever existed. Hilly, green grass for miles, canyons, and beauty that will take your breath away. Out here is where Odin's Revenge lives and breathes. It has a challenge for you that is tough as nails, and in my opinion, it is the toughest 100 plus mile gravel event anywhere. The usually lazy, meandering Platte River was swollen to epic proportions due to Colorado's heavy Spring rain fall, so our usual meeting spot at the KOA Campground was not a viable meeting spot. Instead we met at an old, rustic steakhouse called Walker's Steakhouse. It turned out to be a fantastic place to have our gathering, and the food was really good. I almost expected a long-haired rock band to come out and do some covers of Bad Company and REO Speedwagon songs plugged into the early 70's era Kustom PA system sitting on the old stage there. It was one of those places that seemed like it should have the stale stench of pilsner and cigarette smoke in the air. It certainly showed signs of having been "that place" in days gone by. Instead of that long haired rock band we got something even better. Paul Siebert, a very talented musician and friend of Odin's Revenge, came back to play his instruments and serenade us all with a wide variety of classic rock and folk tunes while we ate and chatted each other up. It was a fantastic backdrop to the pre-race meeting. Slightly run down, 70's decor from a time gone by. The Odin's crowd awaits Chad Q's announcements at Walker's Steakhouse. The pre-race meeting was like those I would hope for. Smaller, folks chatting all over, and the vibe was outstanding. These gatherings are like little gravel family reunions where everyone seems to know everyone else, or will soon know them. It's one of the things I most enjoy about these gravel events, and especially with Odin's Revenge. Well, the pre-race festivities went off, schwag was handed out, and we went back to the motel for some shut eye before the 4:30am wake up call. I got to stay with Jeremy, a local I ride 3GR with on occasion, and the guy that helps me out with Trans Iowa recons. Before we hit the sack, Jeremy said he wanted to ride with me for the event and see if he could help push me across the finish line with his "motivational coaching style". Yeah......more like a sarcastic, biting ribbing on occasion. Ha! Jeremy and I like to throw barbs at each other, so it's all good. Anyway, with that bit of motivation on my mind, I fell asleep. Odin's Revenge is on tap for me this weekend and as you read this, I may already be on my way Westward riding shotgun in Tony's big Ford truck. This is a fantastic event, small, homegrown, and it has really stunning scenery along with a brutally tough course. Fortunately the weather report looks less beastly than it could have been- low winds, lower to mid-80's for temps, but the roads may be a bit rough. 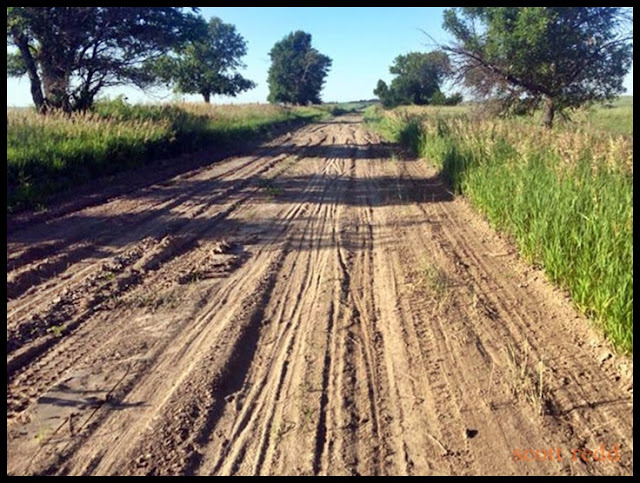 It sounds like the weeks of heavy rain coming into the event have caused many ruts in the dirt road sections with some silt having been deposited in many places out on the roadways. No worries here- I have the Fat Fargo ready and I think it will prove to be a good bike for the rustic and primitive roads of West Central Nebraska. Me? Well, I have been taking it easy this week. Since the DK200 I have gotten real sore in the hips and sometimes upper leg area after harder efforts, but I am where I am at. I have a nutritional plan and hydration plan based on my DK200 attempt. I am taking into account that it will be warmer, so I have modified things a tiny bit. Anyway, we'll see how it all goes after this weekend when I will be posting up the race report. Beast of the East rises again. Cannondale has finally entered the fat bike market with a Lefty equipped, 4.0" tire sized rig that claims a "lower Q factor" than other fat bikes. What is really cool is that Cannondale has brought back a storied model name and look to have done it up correctly. That would be the new "Beast of the East" model. You younginz readin' this writin' may need a bit of a history lesson here. 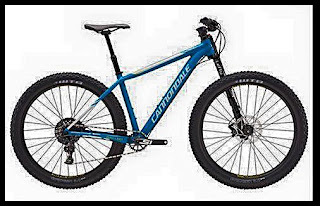 The Beast of the East was Cannondale's mtb hardtail that was fine tuned for Eastern USA "woods riding". Specifically, it had a very high bottom bracket, (the better to clean downed trees with, my dear), and short rear/long front center geometry with a fairly steep head angle. Fine tuned for "plunkin' and steep climbs", the Beast was unique and on an island all its own for years. Typically, the rig was sold as a totally rigid bike with the ginormous aluminum "Pepperoni" fork. This bike was an acquired taste for sure, but it was cool to see a company stick to its guns for as long as C'dale did. Of course, when the turn of the century came this bike had long been out of the line up. Now it is back with what looks to be a short rear end and that head angle? 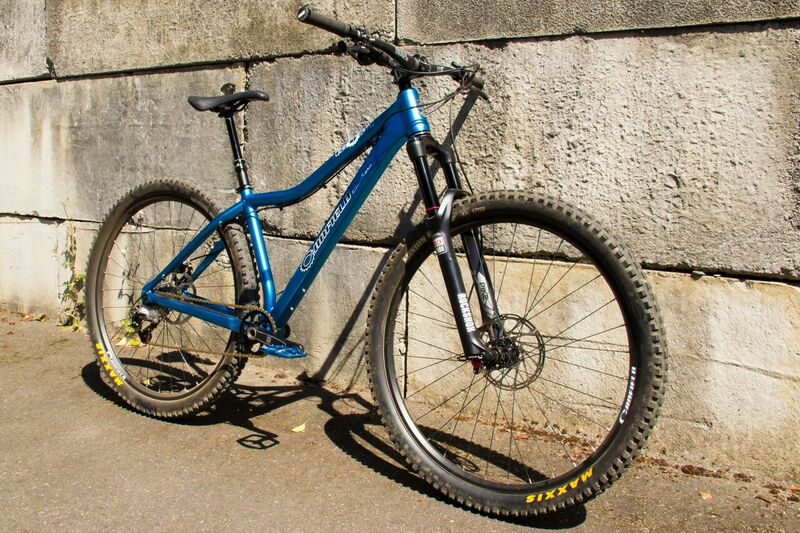 Is it just me or does that look a tad steep compared to what we see with other trail bikes? It does have B+ wheels, so it's a mid-fat bike, which makes total sense given the heritage of this bike. This is a Cannondale for exploring, poking around deer trails, and general bushwhacking. This is the exciting bike here, not the fat bike. 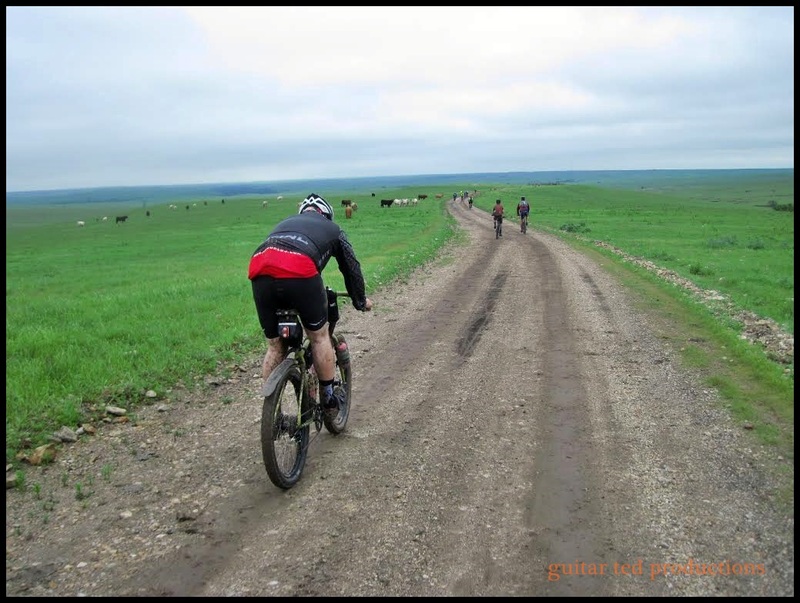 Fittingly, the tenth episode of the Riding Gravel Radio Ranch celebrates the winner overall of the tenth Dirty Kanza 200, Yuri Hauswald. You can click here for the page where the podcast can be accessed. It's an hour and forty four minutes of good stuff. First, Ben Welnak and I give our race reports from the Badlands Gravel Battle, (Ben) and the Dirty Kanza 200, (me), which is followed up by over an hour with Yuri Hauswald. This might be our best interview so far. Yuri takes you through the ways he was drawn into the gravel scene, recounts his training, and then goes on to describe his race and thrilling sprint finish after 200 grueling miles. Yuri also gives us a gut wrenching account of his motivations and how he has been affected by the loss of his father to cancer and his wife's battle with cancer. Finally, he assesses the allure of the gravel road riding scene and gives an excellent set of reasons why this sort of riding is catching on. 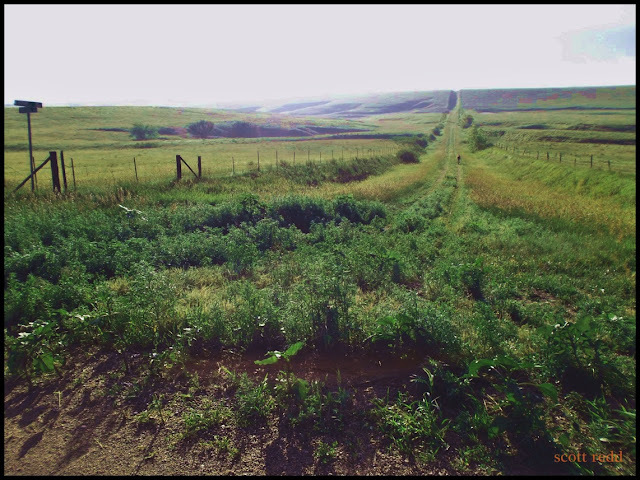 Check it out by downloading it from the show page at the link above, or check out the Riding Gravel Radio Ranch on the aps for iPhone and Android on Mountain Bike Radio. Hey, I gotta run. There's this crazy gravel road event I have to go to. See ya later! Keep the rubber side down, ya'all! Sharp eyed readers will recognize this bike as the one I got a while back as a hand-me-down since it has always been associated with the shop I work at. If you don't remember or want to check out the back story, see this post. The 1X1 as I have it is a sort of "time capsule" bike in that the geometry was informed by the trends of the 90's in terms of 26 inch wheeled bikes. Remember- 29"ers had barely been around in '99 when this frameset was minted and otherwise, it was an all 26"er-all the time world. Everything about this single speed bike reeks of pre-29"er days. Even my build is "vintage" with 90's era wheels, tires, crank set, and 80's era brakes. The newest parts are the bars/stem, grips, seat post, and saddle. So, it is interesting to hop aboard a bike thought to be fine tuned for off road riding circa the late 90's. Handling: Oh my gosh! This thing is twitchy! It feels super squirrelly in my view. The bike even exhibits a tendency to flop the front wheel even when pushing it from the saddle when you are off it. Directional changes are initiated when you barely twitch an arm or leg. Bumps upset its forward motion. Wheelies were never so easy. Was this what they were talking about when they said they wanted their 29"ers to handle like 26"ers? I am super stoked they never figured that out then! Well, except for the wheelie part. They have that figured out now for 29"ers and that is very good. Momentum: Yep.....you gotta keep on the gas more when you ride a 26"er. That is very apparent. Conversely, it is really easy to go from a stop to spinning out your gear compared to my 29"er single speed rigs. Wheels And Tires: Leaving aside the diameter issues for the time being, the narrow rim/2.1" tire combos we used back then were, in a word, dumb. I tried running 40psi in the rear tire, (toobz- of course! ), and I thought something had come unhinged on this bike in the rear end. It was the softer tire wallowing on the narrow, unsupportive rim. I bumped up the pressure to 50psi, and the sensation went away. But........50psi!! Yeah.....those were the daze! I can easily run low 20's psi on wider rims with bigger tires, and on a B+ set up? Never higher than 20psi, and that's only for gravel roads. My tires now never felt so stable and secure since I've compared them to these old wheels on the 1X1. Is the 1X1 an antiquity never to be considered a serious off road vehicle then? Heavens no! I would probably change the wheels, first off, to wider rims and tubeless tires. Then I'd get some proper linear pull brakes, because the bike is cantilever only and the old 80's brakes are pretty weak. Maybe a more upright stem? Yeah. If this bike wasn't attached to the legacy it has, I would size up to a 20"er and get a modernized 1X1 with disc brakes, but this old skool ride is definitely not going anywhere anytime soon. Other than fine details, this is ready to go again. Well, the time is coming that I have to pack up for West-Central Nebraska. It looks to be another "gravel family reunion" out there, and in terms of people, it should be fun times. I'm looking forward to all of that. However; I have a few tweaks to make yet, and I am not 100% sure where I am staying yet. But that's probably going to be sorted out here soon, so no worries. The rear hub overhaul went well. I tested it out on the commute to work yesterday and there are no worries there with how it will perform. I will say that it is so much quieter now it seems wrong. I mean, a Chris King hub should be fairly buzzy and loud, right? If I attend my ear to it, I can hear the familiar, but muffled, buzz just like before. I suppose as time wears on it will get louder, but it seems almost stealthy in comparison to how loud it was at the end of the DK200! I will have to tweak on the front derailleur a hair. I noted that it wasn't going to work at the DK200, but then again, I didn't really need it there. There were maybe two times I had to hop off and crest some crazy 30 foot steep on a ranch road, but otherwise I middle ringed it most of that day. This deal at Odin's will require a granny ring, if my past experience tells me anything, and I want it to work there. I also have to work on the rear brake. It slightly drags on the outside pad, and I think I'll have to take those nested washers out and swap them around to avoid having everything resetting back to where it was when I start adjusting on it. These are BB-7 brakes, by the way. Those washers have a tendency to "take a set", so I've dealt with this before. Once I've perfected the brake, I have two other small details to look after. One will be finding my headlight mount, which I laid aside when I was swapping out bars to the Cowchippers. Then I want to check my computer against a tenth mile post over by the expressway for accuracy on the computer. I think I may be off there. Other than those few things, I just have to pack up the bags and get myself out there. More rebel B+ , Fat Fargo, gravel grinding action coming soon! Has gravel grinding lost its way by getting too commercialized? Lately I've noticed a lot of comments to the effect that gravel events have become "too big", or that the genre' has lost its way by becoming too commercialized. Even I have been personally accused of becoming a "sell out" because I review too many products and have joined with RidingGravel.com. I have decided that it is time to address this nonsense. First off, let me say that wherever there is a "trend", people gathering, or wherever you find a lot of social activity centered around a certain type of event, there will be people that jump in to provide services, "a better way" to do something, or to make the activity more enjoyable. Most of these folks will want some reward for their services, ya know......like money. Try getting a beer at an event at most places, and you'll be asked for money in exchange for that beer. Try getting food at a restaurant and more than likely, you will be asked for money in exchange for your meal. Does that make eating out, or drinking beer a "sell out"? Or if you want to talk about cycling, ya know.......just forget about that, because it is too commercialized and you have to pay money to get a bicycle. Bah! It may seem absurd to even have to write this stuff, but whenever I see folks accuse anyone of being on the take, or accusing any activity of becoming "too commercialized", I have to call BS. Why? Because those statements are absolutely absurd when you look at who is saying them for consistency in their philosophy. None of these folks are free from supporting, heck......even liking, activities, organizations, or other people that are highly commercialized, "on the take", and in may cases, out and out "sell outs". What separates the gravel events from much of this is where the hearts and passions of the folks are behind the scenes of these events. If you haven't spent time with many of these folks, as I have, you should before you pass silly questions like "has gravel riding lost it? ", and other such crazy talk. It isn't easy putting on events for others to ride in. Here's another thing that may be obvious, but needs to be said- "If you don't like where gravel events are going (a) don't support them, or (b) put on yer own damn event and show us how it's supposed to be done." Event creation, logistics, research, promotion, and production isn't necessarily all that easy, but if you want to be a Monday morning quarterback, and pick us folks apart that do the hard work, here's where I call BS again. If you are of the mind that these events are too "this-or-that", (whatever your beef may be), I am not even going to give you my consideration if you haven't put on an event yourself, or if you haven't been carefully considering things at events you have been at that feature gravel riding. Most of this chatter concerning gravel events getting "too big" is coming from voices that are not informed, considerate, or very insightful. But as I have always said, (from a phrase borrowed from Mike Curiak), "If you don't like how an event is run, maybe it isn't for you." A third really obvious thing: There are a lot of free, small, "under-the-radar", events happening all over the place all year long. We have listed 270+ events on the RidingGravel.com calendar where you can find many of these. In fact, most of the events on the calendar are small, basic events that charge a nominal fee or are out and out free events. Many are charity/fund raiser events for great causes. Hardly a "sell out" in anyone's viewpoint. Oh......and we are adding new events monthly. Most of them events of this type. Then there are those of you that are worried, curious, or just being "Debbie Downers" when it comes to all of this getting "uncool", changing for the worse, or going mainstream. Look.....the truth of the matter is that most folks don't even know what a gravel road is. The chances that this scene is going to get gobbled up and spit out by corporate America is about as high as seeing Martians on your next training ride. Ain't gonna happen. Especially seeing the folks I know toiling behind the scene. This bearing was very reluctant to rotate! With Odin's Revenge less than a week away, I suppose it was high time I get the rear hub squared away! The deed was just going to be a simple maintenance of the Chris King hub, or so I was thinking. The rear wheel worked perfectly during the Dirty Kanza 200, but I heard it getting louder as the day wore on, and that could only mean one thing- The grease was getting washed away, and that hub was going to be dirty when it was all said and done. That was what I thought anyway. Well, I cracked it open Sunday, and it was a little more than I had thought. Yes, it was dirty, dried out mostly, and needed to be serviced for sure, but there was one more thing. The drive side bearing was not rotatable by hand. Yeah........that's not good. Now here is where you get your money's worth when you buy a Chris King hub. This is my opinion, but I think I am pretty spot on when I say that a Chris King hub is very expensive, but it is very maintainable and can be made to last a very long time. Case in point- the sealed bearing that was an issue with my hub. On another front, I got a hold of a highly regarded penetrant and let it fly on the Karate Monkey's bottom bracket. I let it sit for a day, then hit it with the wrench and hammer, and what do you know? The old sealed bottom brackets Shimano made were kind of odd. Many had the removable cup not on the non-drive side, but on the drive side. That's how this one is, and I manged to get it loose, so now I can get at the cartridge with more of that penetrant, which should help tremendously. This is the first progress I have made on this bottom bracket removal in years. It felt good to get something good going on this bike for once. I spent some time with my son Friday evening and Saturday. To my mind, Father's Day should be spent with those that "made you a father" in the first place. Ya know...... your kids? I usually don't get to far off the subject of bicycles here, but today, it feels like this is the time to maybe put something a little more important than bicycles ahead and post about that. We could all use more Fathers being good fathers. Where are the tubulars for gravel? There have been tubular tires for bicycle use for over a century, and much of that time the roads were gravel, dirt, or poorly paved. So, it isn't like the concept of a tubular wouldn't work, because clearly, history shows us that it can work and work well. Secondly, as with any other bicycle related thing, materials technology has advanced light years beyond where it was even ten years ago. This is important because the way in which we affix a tubular tire to a rim is changing drastically right now. That will make tubulars a much easier choice for cyclists going forward. Finally, the way in which tubulars work could actually make tubeless tires for gravel roads a poorer choice. For one thing, you'd never have to worry about burping a tire, blow offs, or rubber degradation which could lead to a blow off. Then there is weight, and that's a game a tubular tire and wheel will always win over a clincher. The thing is, the hang up has always been the archaic way we've been affixing these tires to rims with glue. Folks don't want to mess with that, and it makes for a difficult situation in the field when it comes to a catastrophic flat, in which case you have to replace the tire. Well, now there are rim tapes out that solve this problem to a greater degree than before, and just on the horizon, there is the promise of a tape that will base it's tire holding prowess on air pressure. 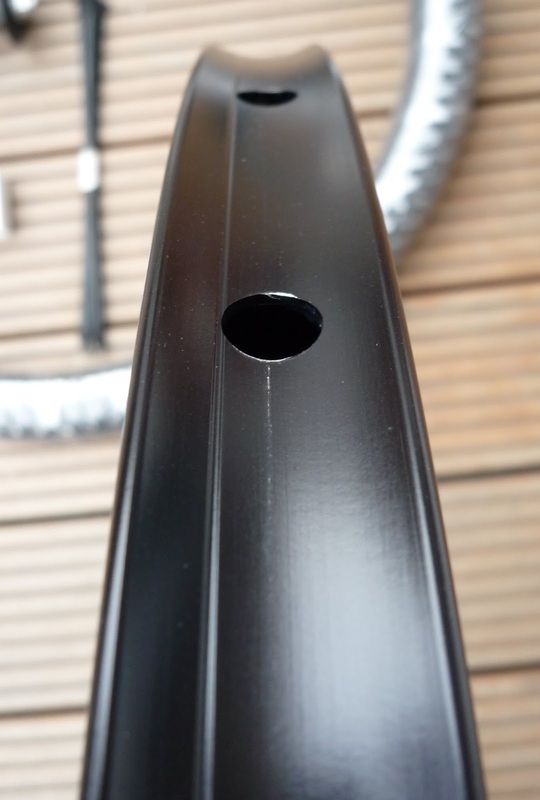 More pressure in the tubular pressing against the rim will equal a greater resistance to sheering forces. Less pressure in the tubular will create the opposite effect. That would mean that in case of a flat repair in the field, the new tubular could be exchanged easier, and when inflated, would theoretically have the same adhesion to the rim as the previous tire when it was inflated. Immediate adhesion, and ease of mounting/dismounting tubulars would revolutionize the idea of tubular tire usage for all sorts of cycling, and gravel road riders would benefit. I think tubular tires like that in larger sizes, like 35-40mm, make a lot of sense for gravel roads. I say bring it on already! This year's edition will be on Saturday July 25th, 2015. 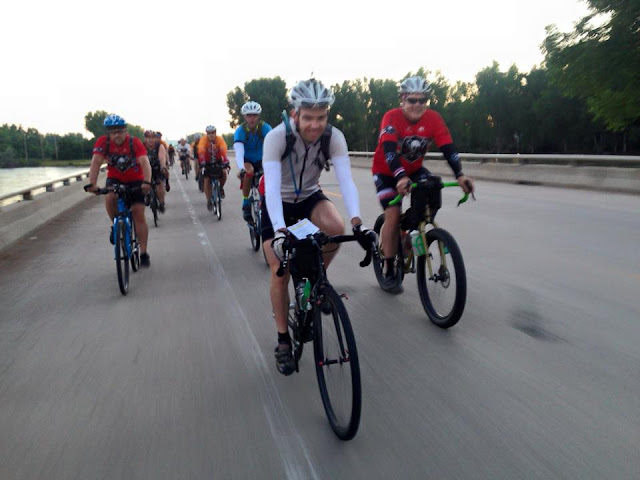 The ride will start at 5:30am and will be approximately 120 miles long. (I have 115 down, but it could be longer than that. Gotta check my old cues.) This will be a super tough day in the saddle if the weather is typical for that time of year. (Read "hot, humid, and possibly windy") Out of the three attempted GTDRI's on this route, only the first try was successful. One year it was just too blamed hot, and last year.....well. There was that crash where I got hit by a truck. So, I'm going back to finish the job and check this one off the list. There will be more on this ride coming soon, but first I have Odin's Revenge to get through, and my main focus will be on that for now. That said, if you have any questions, feel free to ask in the comments or to shoot me an e-mail. That's it for today. Have a great weekend and ride your bicycle somewhere fun! Wednesday morning I awoke to wet streets and dripping eaves. Bah! It had rained again during the evening, and it looked like it could again soon. It was cloudy and so I decided to rearrange my ride schedule to the afternoon instead. I needed to ride when it was warmer anyway to help myself acclimate for Odin's Revenge, which I am expecting will be very hot. I cleaned and re-lubed the Twin Six Standard Rando with new lube for the Lube-Off, (more on that soon in a separate post), and then I did a podcast for RidingGravel.com with my partner, Ben Welnak. We got to interview Yuri Hauswald, the winner of the Dirty Kanza 200 this year. It was a fantastic, insightful, and fun conversation. I'll be posting up the link for it soon when it gets published. That took me into mid-afternoon, so by then it was good and hot out! I decided to kit up and ride for at least a couple of hours instead of mowing the lawn first. The Standard Rando was the steed for the day. I am growing to really like this bike. Like anything, it isn't perfect, but it's darn close. That is one reason I am seemingly getting along with it so well. I'll not delve into this too much here, as I want to reserve my specifics for the review coming up on RidingGravel.com. The clouds were really dramatic yesterday. Some farmers are starting to mow their ditches, which leaves a bunch of grass clippings on the roads in spots. I went out to do a 20-ish mile loop I have established for quickie rides. I didn't want to do a big ride initially because I figured I had better save some energy in the tank for that lawn mowing I was neglecting. (And it really needed done!) I was cruising along Eastward, expecting to pick up the tailwind on my way back into town, when I saw something. A road sign warning me that the road was closed ahead. So, instead of getting that turn out of the wind, I was obliged to turn right back into it to find myself a detour. There's a barn quilt there for Chad. These parts have a fair share of paved roads and I was obliged to finally take that a few miles to get back into town. Not my choice, and there was far too much traffic for my tastes, (a special nod to the inconsiderate fellow in the white Toyota Corolla, by the way), but I did manage to get back to town and gain some bonus miles along the way. By the time I got back to the house, showery weather had developed. So, I got even more of a work out while mowing as it ended up sprinkling on me rather heavily for a moment. It only ensured that the grass would be heavy, sticky, and that it would foul the mower at times. I did manage though, and the lawn should be tamed for a while, at any rate. So, all in all a successful addition to the training for Odin's Revenge and while I won't be taking those detour miles again anytime soon, I did get to see some of the country I wouldn't ordinarily travel through. When faith and trust are broken, events will blow away like dust. "One of these days someone is going to do something stupid and ruin it for everyone." That day has come for an Oregon event called the "Oregon Outback". That day could have come at anytime earlier to any number of free, self-supported events, but in this instance, it was particularly unnerving, from my point of view. There are many reasons for that, not least of which is the fact that I also produce a self-supported, free event. The tenuous strands of trust between riders, promoters, and the public are often strained, and without that trust, there is really no way events of this kind can survive. First of all, let me say that I am not casting people that do these things into the fires of Hell. No, but I am going to point out that people do stupid, self-serving things that are inconsiderate of others. Those action should be vilified. I feel like most of these people are usually decent, but made a stupid decision. The consequences of these actions affect all of us- Not just the riders, but everyone. Secondly- Rather than listing off all the instances and ways that folks have or could destroy the trust that exists between riders, promoters, and the public, I would just like to encourage you. Please be respectful. Think about what you are doing in a way that includes everyone- not just yourself. Your actions affect many, and are not limited to yourself. The "it's okay as long as it doesn't hurt anyone" way of thinking is severely flawed logic. Your actions always affect someone else. It is an inescapable truth of being alive. Let's do the good things you think no one will notice. Let's be safe out there. Let's keep riding free. I've been a single speed kinda guy since way back when. I was reminded of this the week after Dirty Kanza when I was riding the 3GR with my friends, They remarked how "single speeding had served me well". That was what really made me reminisce. It wasn't anything I had planned, or sought out. Single speeding was a way of life for me. If I was to be riding a bicycle when I was young, there was no question- it was a single speed bike. There were probably several reasons for that. one being the rarity and expense of geared bikes for kids back in those days. My parents were not wealthy folks either, so just having one bicycle was kind of a big deal for us as kids. Mine was a lime-ish green metal flake "stingray" style bike with a black and silver metal flake vinyl "banana seat" and a tall "sissy bar". What it was geared to, I have no idea at all. I just pedaled! That bike lasted for a long time during my growing up, but I eventually outgrew it, and that bike was replaced with another single speed, "English lightweight" style Huffy, with a coaster brake. That bike became my urban scorcher, my off road bike, and my dare-devil rig. Again- I have no idea at all what it was geared at. Gearing? Whatever! Pedal harder! Then life and geared bikes happened. Heck, I didn't even know what to do with either one, and it took me a lot of years to get things sort of squared away. I never did lose that single speeding bug though, and I still have it. I need to be out scratching that itch real soon again. I really miss it. 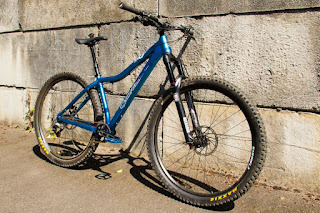 In my first post on this new Salsa Cycles bike, (seen HERE), I gave my initial thoughts on this bike. I have been watching with interest on social media for the reactions to this new bike. A couple of things stick out for me here. One thing is the sense that people have gotten that this is a bike about having adventures on. The second thing I've noticed is that many are seeing this bike as the ultimate gravel road warrior. The adventure bike thing has two sides to it. 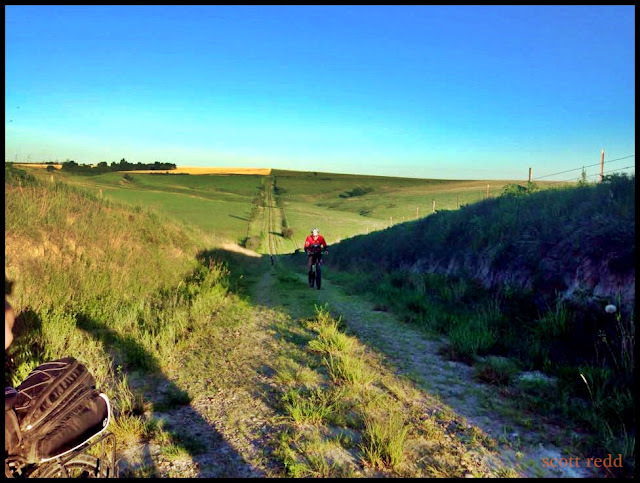 On one hand, there are those who are saying "any bike can be an adventure bike", so this bike is just cashing in on the Tour Divide thing, or whatever. Some are also saying that the drop bar mountain bike thing is old hat and Salsa seems to think that they invented something here, which, as they say, they have not. What's in a name anyway? Is the Cutthroat an"Adventure Bike"? Interestingly, my friend takes on a similar subject in his essay on "gravel bikes" and what to call them. On this bike though, it isn't so much that the Cutthroat is being called an "adventure bike", but that it epitomizes what Salsa Cycles' marketing has been all about since late 2008. The motto is "Adventure By Bike", and their whole bicycle line up revolves around this theme. 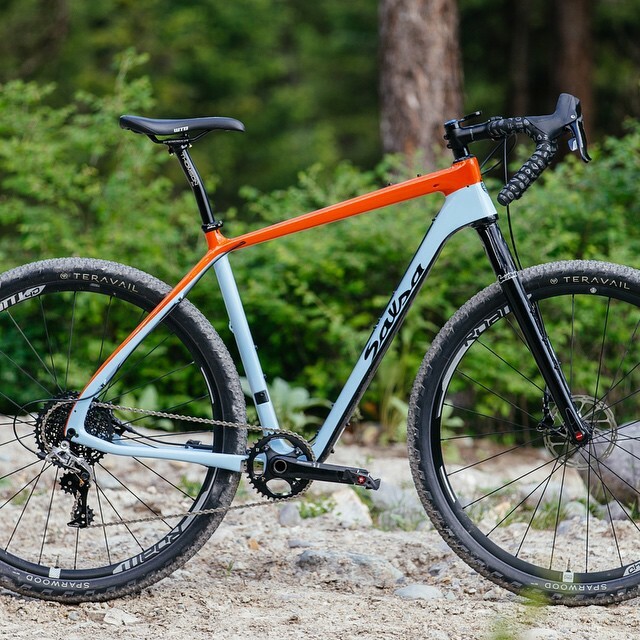 Ever since the "second renaissance of drop bar mountain bikes", which was ignited when the Fargo came out, Salsa has preached the "Adventure By Bike" thing, and back in '08, no one else was talking about this. Now the Cutthroat is the pinnacle of this theme with a lightweight, innovative carbon frame, drop bars, and the fittings to out fit it as a bikepacking rig, if you want to really get off the grid. Like the Fargo before it, the Cutthroat will become a blank slate for people's individual interpretations. There will be flat bar Cutthroats, gravel-centric Cutthroats, mountain bike, front suspended Cutthroats, and urbanized Cutthroats. 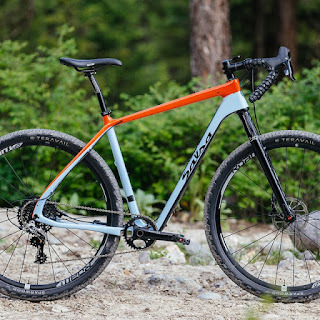 Sure- the Cutthroat is maybe not going to be able to be interpreted as a "traditional" touring bike, like the first Fargo was, but there are other Salsa bikes for that purpose. The Cutthroat is the perfect high end, high tech offering that lets you interpret what a drop bar mountain bike for "Adventure By Bike" looks like to you. Does that make it an "adventure bike"? I think it does. The gravel idea for the Cutthroat is what I thought was most interesting. Folks were catching on that if the higher end Cutthroat, which is claimed to weigh around 22lbs, is fitted with a set of lighter weight, gravel road type tires, it would be even lighter. You could have a 40mm tire with tons of clearance for one event, then swap out to 2.1's for another, and get rad on 2.4"ers on the weekend single track outings. Could it be someones "quiver killer"? Possibly. More so than a Fargo, or anything else in Salsa's current line up. The thing is that however you look at it, the general reaction from many folks is that the Cutthroat seems to be getting a lot of folks talking about having bicycle adventures, and that's a good thing. Whether or not they all end up getting this fancy, swoopy carbon steed is not as important as the ideas that the Cutthroat represents. Hopefully it brings more action than words in the end. Checking in with a couple of the contenders here in the "Guitar Ted Lube-Off Round Two". 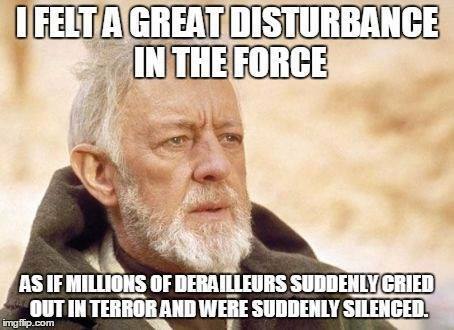 Today we are going to see how the DuMonde Tech and Boeshield T-9 are holding up. DuMonde Tech: After approximately 60 miles the DuMonde Tech has seen dusty roads and a wet, muddy commute where I ran through several water puddles and some gooey mud. The results are what I expected since the same thing was witnessed at the Dirty Kanza 200. This lube seems to shed the dust fairly well, and although you get a little dirty residue when you draw your fingers across the rollers, it is not totally dry, and the chain is silent yet. The cassette is fairly clean and free from gunk so far. The jockey wheels on the rear derailleur are still looking fair. DuMonde Tech doesn't recommend reapplication until the chain gets noisy, so we will see how long it takes to get to that point. I have been pleased so far with the use of this lube and as I have said at the outset, this was the benchmark lube against which the others chosen have been pitted against. After approximately 100 miles, the T-9 is looking pretty dusty. Boeshield T-9: While I haven't been on any wet rides with the T-9, I have racked up a good 100 miles of dry, dusty Iowa gravel and some commutes to work on the lube. The results are not as good as the DuMonde Tech. This lube seems to collect dust, although I have to say that the rollers of the chain look fine. Still, when I rub my fingers over the rollers, I get copious amounts of dry gravel dust to fall out. The chain, surprisingly, is quiet though. The cassette has a fine coating of the gravel dust on it, and the rear derailleur jockey wheels are collecting gunk now. While it isn't clear on Boeshield's T-9 page when one should re-apply the lube, it does say the following: "T-9 dries to a clean, continuous wax film that performs better than Teflon and lasts up to 200 miles without picking up dust, dirt or mud,"
It is abundantly clear that the lube has picked up copious amounts of dust at half that claimed distance, so T-9 becomes our first contender to be knocked out of this competition. The lube has allowed such an amount of dirt to accumulate on this chain that at this juncture I feel it would be prudent to clean the drive train completely to arrest further wear from the dirt/gravel dust that is stuck to the drive train now. You can actually see where the side plates of the chain have been abraided by the dust, and when I saw the amount of dust I got on my fingers when I rolled the rollers , I found it quite surprising. 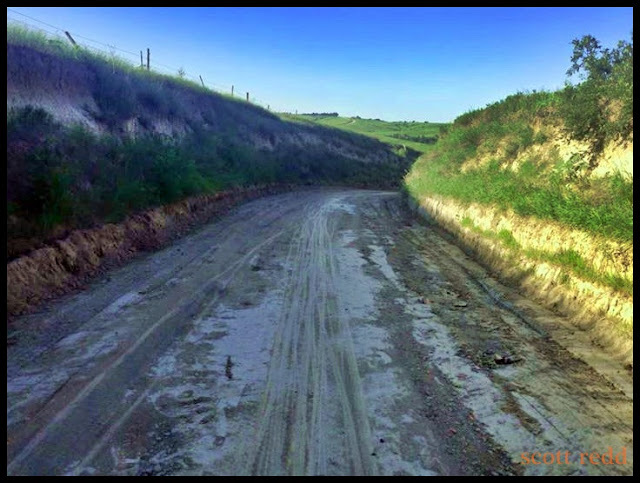 To be fair, the Boesheild site seems to indicate to my way of understanding that it works better in wetter conditions, but I can say without reservation that it simply doesn't work very well for gravel road riding. Next: The T-9 will get replaced by ProLink and the Rock & Roll lubed Black Mountain Cycles rig will get back into the mix. Sometimes you have to be patient with your cycling desires, especially when you are a husband, father, and.......a bicycle mechanic. You see, sometimes folks find out who you are and what you do, and they "need help", so, you know.........the next thing ya know you're working on somebody else's stuff and not your own. Saturday was such a day. I fetched a couple bikes from out of town and took care of them, then delivered them back again. That pretty much shot my day. It was on to barbequing and eating with the family. By the time that was over, it was dark, and I finally got down to the Lab to attempt to finish off a project I had started several days ago. The refreshing of the Singular Cycles Buzzard. Besides restoring it with the chain and rear derailleur I pilfered off of it to test the ten speed Gevenalle GX shifter, I needed to refresh the sealant in the tires, since the bike hadn't been ridden in a month of Sundays. In fact, the tires had actually pulled down off the bead seats, so I actually had to reset the beads by pulling the valve cores out and hitting the tire with a blast of air from my miniscule air compressor I have in the Lab. It took a couple of tries, but after adding a little more sealant, it went together. I still have to get the chain taken care of. Either shorten the old one, or go with a new one. Then it's on. Ready to shred. It's NOT A Carbon Fargo! Salsa Cycles has been pretty adamant in that assertion. However; one cannot deny the lines cut by this bike are very similar to those cut by the Fargo. Drop bars, room for up to 2.4" tires, Anything Cage mounting points, and a 100mm suspension corrected fork. All that is missing are the Alternator drop outs. Then it hit me. Salsa has done something like this before! 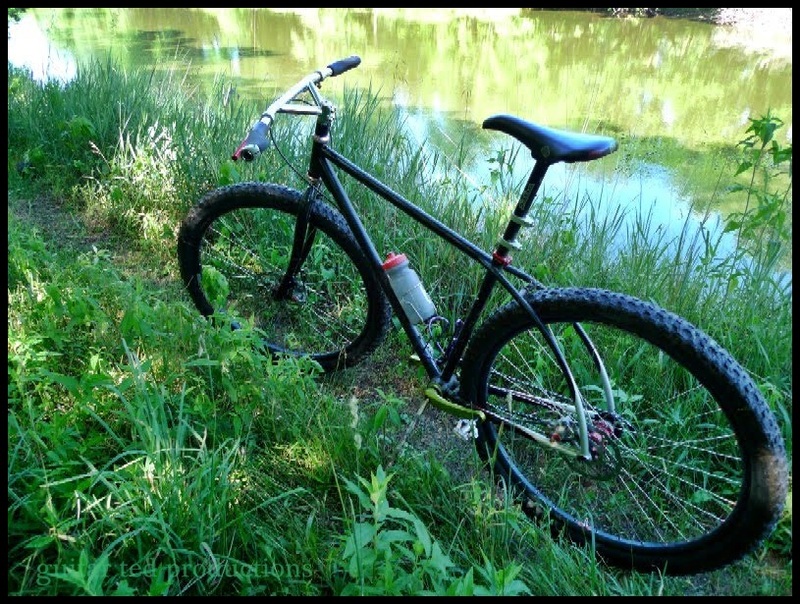 The Mukluks were Salsa Cycles only fat bike at first. The line up had aluminum models and a titanium model. Everyone was thinking that a carbon Mukluk was a given, since many other fat bike companies were doing a carbon model. However; as we all know now, Salsa did not produce a Carbon Mukluk. They did do a carbon fat bike, but it was a stripped down, all out performance machine they dubbed the Beargrease. I see what they have done with this Cutthroat Carbon drop bar mountain bike in much the same light as the Beargrease vs Mukluk models. While the Fargo-Cutthroat comparison is obvious, what might get lost in the hoopla is that this bike actually has a close relationship to the just released Warbird line up. 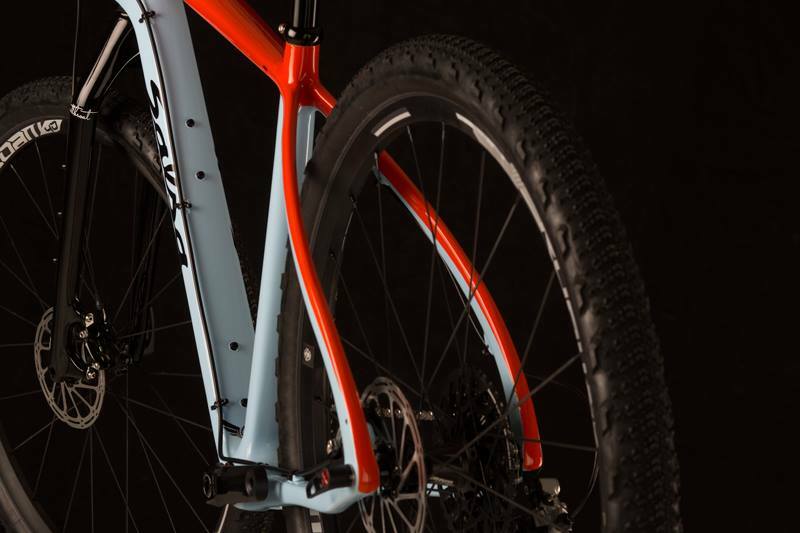 The Cutthroat features what Salsa Cycles has dubbed as the "VRS" rear triangle. (Vibration Reduction System) The stays are thinned out in the vertical plane and the chainstays are flattened horizontally which makes for stiffer chain stays in the lateral plane and flexier seat stays in that same lateral plane. That may not make much sense when you think about how many companies have tried to flatten out or thin out seat stays to get them to flex in the vertical plane. It was noted by Salsa engineers how while testing frames in frame jigs for strength, that the seat stays would bow outward as pressure was applied backward against the seat tube while the axle was fixed in the testing jig. It occurred to Salsa at that point that rider weight and trail/road inputs acted in much the same manner as the testing procedure. What if the rear triangle could be optimized to enhance that flex? This is what led to the VRS idea and why it works like it does. 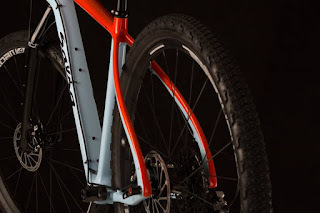 The VRS rear triangle allows the seat stays to bow outward as the rider's weight gets planted down and back into the saddle when a trail input is engaged by the rear wheel, for instance. Much like how a flexible titanium seat post takes the edge off, the VRS system takes the bite out of the trail and lends a more comfortable ride quality. To my way of thinking, this sharing of the VRS system from the Warbird to a "mtb-able" version in the Cutthroat is the biggest story with this new bike. When you consider how those seat stays and chain stays work, it maybe makes sense why this bike cannot really work with Alternator drop outs. More of a "heavy duty Warbird", less of a Fargo here, I think. The next thing that is maybe getting lost here is how Salsa Cycles has fine tuned the bikepacking aspect of this bike here. Dedicated to frame bag type loads, the front triangle is shaped in such a way to accept a massive, wide frame bag, which will be custom made for this bike and available through Salsa Cycles. It will hard mount to the braze ons, which you can see some of in the lower image, and eschew straps, lending a cleaner look, and I suspect will be less apt to cause abrasion damage, which could be an issue with carbon fiber down the road. At any rate, it would seem this is the way bikepacking bags are turning in terms of design and mounting type. My take on this rig is that it is a curious type of bicycle for anyone, let alone Salsa Cycles, to produce. It would seem that, on the surface of it anyway, that there just are not a whole lot of folks willing to bicycle in the manner to which this bicycle is intended to be used, and maybe even less that would want this type of bike made out of carbon fiber. Yes- the overall weight is tantalizing, (21-23lbs, depending on model spec), but carbon fiber is a pretty expensive material and maybe doesn't imbue a sense of impervious, robustness that a metallic frame maybe does for some riders. On one hand, this rig, even loaded like my Fat Fargo was for the DK200, would weigh in a good 5-7lbs less than that bike. That's very, very tempting, but again, the cost of entry is quite a bit higher as well. I like that it can handle the bigger, wider tires, and one could use a suspension device, I would assume, which also broadens its appeal here. That said, time will tell how it is accepted. It definitely is an interesting rig, and I will be looking forward to checking one out at some point. Whether or not it may become a replacement for one of my Fargos. that is yet to be seen. I've written in the past that disc brakes on gravel road/road bikes is silly, unnecessary, and probably is a marketing driven phenomenon. I've posted here about how disc brakes on road bikes are not the panacea that many think they are and I have cited examples of where disc brakes have let folks down. Not to mention the heat management issues for long road descents, but anyway.... I'm not entirely against disc brakes for gravel riding, but I just don't think it is all that necessary either. It seems that someone at BikeRadar.com experienced a similar fate as some Trans Iowa riders have in the past and set out to run a little test to see about the reasons why that happens. (Click HERE to see the article) One thing I would add to the story there is that it is also important to note what it is you are bathing your brakes in that makes a them disintegrate. While it is no doubt obvious that a slurry of dirt and liquid will accelerate brake pad wear, the sort of wear evidenced in the article linked here would seem to be exacerbated by the grittiness of that stuff that was being sprayed over his calipers. Not every situation will be as dire since not every rider will be sloshing the same sort of abrasive mixtures over their brakes, and that's assuming you will ride in such terrible conditions. Colorado grit isn't the same as Iowa grit, or what have you. Another thing to think about while you consider brake choices. I think the writer's conclusions that pad/piston retraction is a factor is also correct. The more pad to rotor clearances you can have, the better, but not all systems will allow for that and give the rider his/her preferred braking feel and performance. So, it would seem that disc brakes are not really "better in bad weather", but they could be. I like a good mechanical brake set up where those clearances can be dialed into your set up, and not fixed as they are with true hydraulic systems. Avid BB-7's being the best in that regard. Finally, a point brought home again to me by our shop's SRAM rep is that disc brakes can separate braking duties from the rim, which can have its benefits as well. There are definitely pros and cons for rim and disc braking systems, and a rider has to weigh those things carefully when choosing a bicycle. Cannondale put out a "sneak preview" video yesterday which was picked up on by almost every major cycling media outlet. If you missed it, the buzz was that a "new gravel road/all road type bike is imminent and will feature a Lefty, (!! ), which will "break new ground in the category". 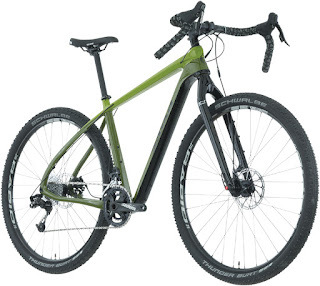 Excuse me, but this is neither new, nor does it break any new ground, especially from Cannondale. Things like this have sprouted out of the formerly USA made brand's line up for years. The Silk Road, and several cross bike models were offered with a Head Shok, pre-dating this new "Slate" line of bikes by a decade. The "shocking" thing about this new bike is that it took Cannondale so long to jump on the trend with a bike that they already knew how to make. In my humble opinion, I believe that Cannondale seriously pigeon-holed the upcoming Slate bikes by using the polarizing Lefty strut. (It technically is not a "fork", but a strut.) 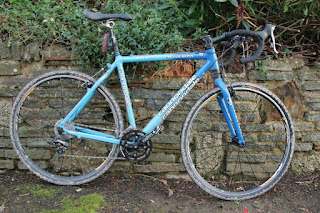 Take a look at this older cross bike with the Head Shok. 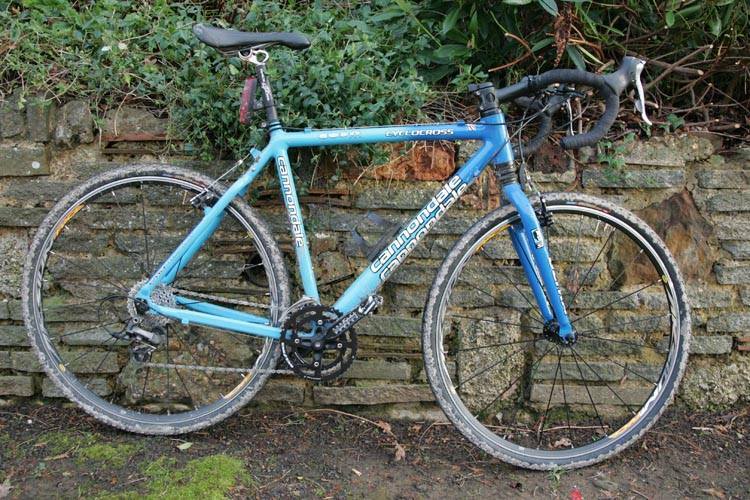 It looks like a road bike, not some freakish, Frankensteinian mash-up of a mountain bike and a road bike. Certainly, it won't be hard to tell it is a Cannondale, that's for sure, but I would have resurrected the short travel Head Shok seen on the example here with carbon legs and I think it would have had more appeal to roadies and gravel riders alike. Maybe I'm just not getting it, but the Slate looks "not right' to my eyes. I know.....I know.....it's a Lefty! Now we'll have to wait and see if this is really a glorified cross bike, or if it really is something tuned for road riding. Cannondale says it will spill the beans this Fall. Fun- If you like your mountain biking experiences to be more about having kid-like fun, you cannot go wrong with this sort of bike. Obstacles that once proved challenging are now mowed over without a second thought, and your mind starts to look for more challenging lines. The maneuverability and capability to absorb big hits with a longer travel fork help here. Throw on a dropper post, a short stem, and wide bars, and you'll be rippin'! It's Not 29+: This is a benefit because you can get nearly the same traction with 2.4"s on wider rims, save the weight, and spin up out of corners faster. Plus, the weight doesn't get out of hand and hinder you when the trail goes up. I use Velocity Duallys with 2.4" tires on my Buzzard, as an example, and it works great. You May Never Need A Full Sus Bike Again: Unless you live in "Chunkville U.S.A.", you'll likely never miss the complexity and maintenance associated with a full sus bike and you'll have just as much fun. Add in the "immediacy" of the feeling of power when making moves and climbing due to the short, rigid stays, and you might become addicted to a short rear end hard tail forever. It's Not Just For The Mountains: Single track? Tight Twisties? These sort of short rear/slack front bikes can rip that once you learn the trick of steering off the rear wheel. I have zero complaints about getting around our tight trails here. Of course, the faster, wide open trails are really fun as well. I was there........and I think I felt it too! Thanks to Chad Ament, who finished the Dirty Kanza 200 on a fixie this year, we have this humorous meme. If you have been to one of several muddy, rainy gravel events this year, you will enjoy this. And with that I bid you all a fair weekend and I hope ya'all get out and enjoy yourselves on your bicycles. A special shout out to my friend Steve Fuller who set out to tackle Tour Divide today. Have a great ride, Sir! It was hot and windy! The Recon: Wednesday was the recon of the route. Jeremy had been pestering me to get off my fat arse and get ready for Odin's Revenge. (He is my unofficial "coach") So, then Tony had been in at the shop to chat and the subject of the next Geezer ride came up. We batted around some ideas. I asked Tony if he was up for a ride Wednesday, and he said he was. So it was that at 9:00am we met to recon Tony's suggestion for a route. I liked it for the several "points of interest" along the way, which can double as a way to gather everyone back up into a group again. So, here I will present the proposed route and some of those things we will be seeing. It was a hot, dry, (low humidity), and windy day. We had a long slog to the North right into the Northeast wind, which was far stronger than forecast. Chunky gravel was the norm, and we worked hard going up past Denver. Along the way we saw the "big rock" of Big Rock Road, Bennington #4 school house, and the Maxfield school, which is next to St. John's Lutheran Church, believed to be the oldest church in Bremer County, and was established in 1856. The 'big rock" is nearly engulfed in the flourishing plant life here. We then took in a stretch to the West, and we will cover a big part of my usual 3GR route in this section which will include the beautiful and unusual Ivanhoe Road. Then we will end up just a few miles Southeast of Waverly Iowa where we will turn South and head up and down some roller coaster hills to just skirt the Boy Scout Camp. There are some beautiful wooded hills around the Boy Scout and old Girl Scout camp areas. 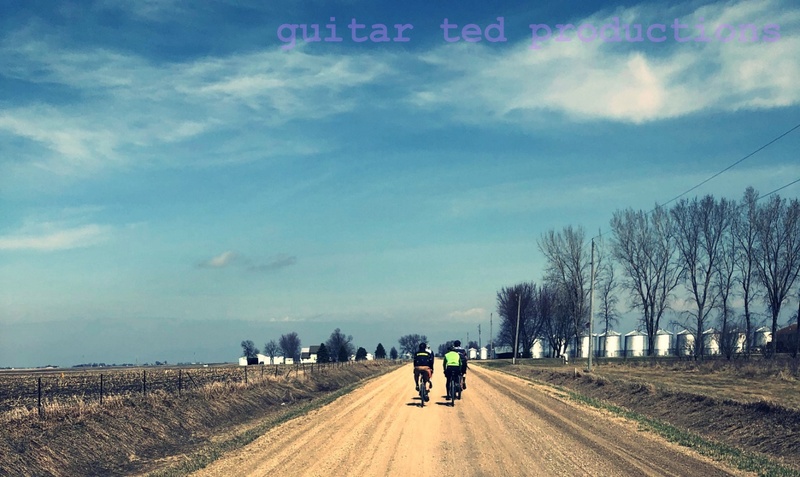 After the biggest hills of the ride, we will zig-zag Southwest to take in our first and only resupply/eating spot of the ride in Black Hawk County's and Bremer County's oldest town, Janesville, Iowa, which is a village that straddles the county line. Then we will eascape Southward and will be obliged to ride about two miles of county blacktop before we turn West and eventually South, then East on Ford Road. There we will go by the Washington Chapel, which is a neat little country church tucked away in a hillside. It gets pretty flat for a while after Janesville. You'd blow right by this church if you didn't know it was there. It is VERY dry, dusty, and chunky out there now. Tony was just uncovered by the wind here after a car had dusted us. The roads are really dusty now. The Counties have spread a bunch of fresh, deep gravel in many spots over the entire course. Will it be anything like this in August? It could very well be....or not. The deeper gravel may cause rookie riders some concern, but again- we aren't leaving anyone behind. Dirty Kanza 200 Report: Moist, Mud, and Madness!